Anyhow, I don’t post alot of meat recipes because frankly, I’m not all that great at making meat dishes. I try, I do. But none of it is really ‘post’ worthy. I basically poach a chicken breast and chop it in pieces and throw it in one of my salads. I do the same with salmon and tilapia. Chicken stock is from a basic roast chicken. I don’t eat much beef outside of quick stirfrys. Pork, veal, lamb and ground turkey I usually make into meatballs or mini sausages (I DO have the recipes on the blog for those though. They’re delicious.) Liver is a quick flash in a hot pan and eaten with a little lemon juice. My meat, in general, is super simple. Get a steak or pork chop, cook it in the pan. Thats about it. (although there is this stewed rabbit dish I should get going on for Easter…). Alot of this is because my former mainstay ingredients like soy sauce or worcestershire, or garlic, or eggs, or breadcrumbs or tomatoes, or dark leafy greens that I’d prepare with meats I can’t have anymore. So I get creative on the salads and for now my meats are simple till I get a bit better at it. Now, about beef jerky. Making beef jerky is something I have been wanting to do for aaaages now. The thing is, every recipe I came across insisted on ingredients like Worcestershire, soy sauce, molasses, liquid smoke, etc… Basically everything I can’t have. Untillllllll, I stumbled across a few terrific ingredients I’d never seen before. The first, is Raw Coconut Aminos by Coconut Secret (If you’re in Ottawa, I found it at Rainbow Foods). Guys. Blew my mind. Its basically soy-free soy sauce!! Its delicious! (I’m psyched to get back into stirfrying!). The next thing I found was gluten free, unsulfured molasses (woot! sulfite free!) Its called Nutrimax Natural Foods Blackstrap Molasses. I couldn’t locate a website for them but if you’re in Canada, you can find it at Loblaws. So, after all this lengthy chatting, let me finally get on to the recipe! Its so simple you’ll laugh that you didn’t try it earlier. I was inspired by the recipe here at Gomestic. 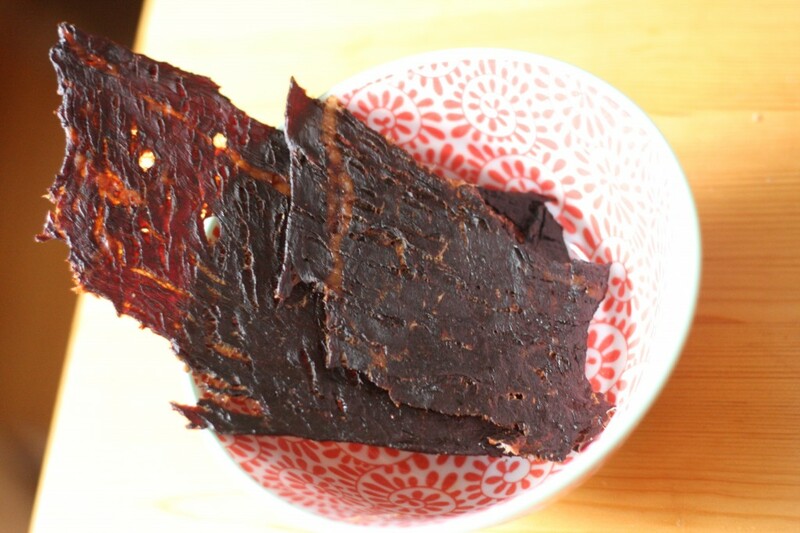 NOTE: I would suggest using chili, or sprinkling on more salt or soy than you would normally use just before putting in the oven to dehydrate- otherwise you’ll find the flavour of the jerky to be a bit neutral. I got the butcher to slice the meat as thinly as possible for me, but if you’re doing it yourself, get a super sharp knife (a boning knife is good), and put the meat in the freezer for about 30 min first, to make it easier to slice. Slice against the grain about 1/8 inch thick. Layer the meat with the marinade ingredients above, and add more or less to your taste. Let soak covered overnight in your fridge. The next day, lay the strips of meat on a metal cookie drying rack, and place overtop tinfoil lined cookie sheets (this will cut down on the mess). Make sure the strips don’t touch each other or overlap. Put in your oven and let dehydrate at its lowest setting for 6 hours. Keep the oven door open a crack to let out any moisture. 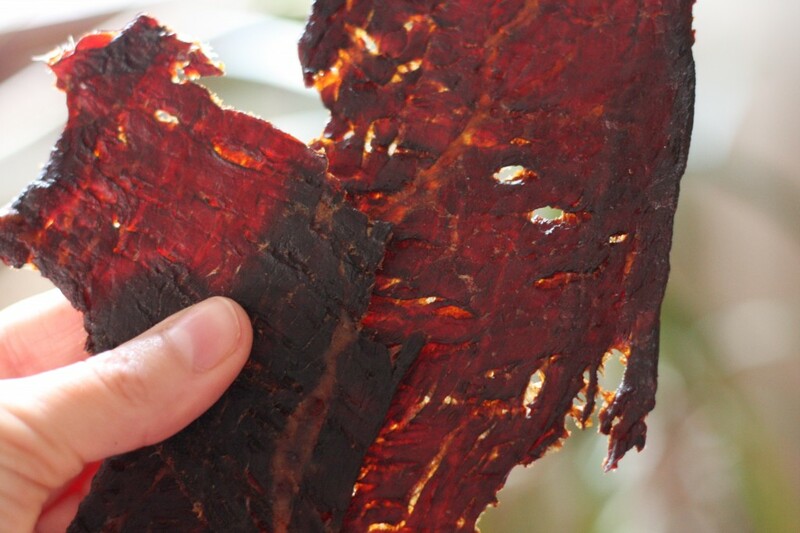 Note- Your jerky will be ready when it breaks pretty easily, but it shouldn’t snap or be brittle. If you use lots of liquid in the marinade, it will take longer for the jerky to dry so you may need to extend the time to 7 or 8 hours- after the 6 hour mark check your jerky at 20-30 min intervals. Use jerk seasoning to spice your meat! Very good. emilie- haha! its super fun :D let me know what neat stuff you put on yours! OmG shut the hell up!! You found soy-free soy sauce!!!! That just made my day! Off to rainbow foods tommorow! Mmmmm looks delicious….Think I can do it with Turkey, thats the only meat I consume really?